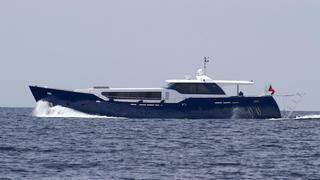 The 31.7 metre motor yacht AD5 has been listed for sale by Camper & Nicholsons International. This distinctive yacht, built and designed by Agantur, was delivered in 2011 and has been exclusively used by her owner ever since. Following a recent refit earlier this year, her condition is described as immaculate. Propelled by twin 873hp C18 Caterpillar engines, AD5 has a cruising speed of 12 knots, a range of 700 nautical miles and a top speed of 14 knots. This custom-built yacht for sale cuts a unique profile on the water, with her wheelhouse and raised saloon dominating the deck space. Forward, in the bow, sits a L-shared sofa and table and above, on top of the saloon lies plenty of space for sunbathing on removable sunpads. Back aft, AD5 has a Jacuzzi and curved seating. AD5 accommodates 12 guests in five suites. These are all en-suite and consist of a full-beam master suite, a VIP cabin and three triple rooms. The interior of AD5 is luminous, thanks to her sheerline that dips to allow as much natural light to flood into her saloon as possible. Decorated in bright neutral tones, her interior is complemented by touches of luxurious materials like oak, marble and leather. AD5 is asking €3,850,000 with Camper and Nicholsons International.